Wednesday marked the closing ceremony of the first regional conference on the role of media in the protection of cultural heritage to be held in Egypt. 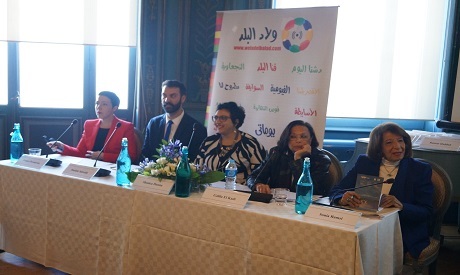 The conference was organised by the Swedish Institute in Alexandria in partnership with Welad El-Balad Media, and was held on the institute’s premises. “The role of media tends to be marginalised when it comes to heritage topics and the narratives of heritage tends to be written by the experts, in isolation, hence came the idea to bring media centre focus on heritage topics and help attract the public’s attention towards heritage preservation,” explained Fatemah Farag, the founder and CEO of Welad El-Balad, to Ahram Online. Among the key figures who participated in the conference were media figures Mohamed El-Moslemany and Samir Omar, journalist Karima Kamal, head of the Egypt media development programme Tarek Atia, the head of the culture section at Al-Masry Al-Youm newspaper Maher Hasssn, cinema director Ayman Makram, renowned writer Khaled El-Khamisy, professor of architecture and urban design Soheir Hawas, and associate professor of the archeology of cultural heritage Monica Hanna. Over the three-day workshop, the workshops and seminars that focused on architectural heritage, as a main theme, brought the best of both worlds, that of media and that of heritage, into an inspiring dialogue that opened numerous windows of opportunities for collaboration in order to preserve our heritage. “Egyptian and Arab heritage is our responsibility as well as our wealth because it creates economic dynamics; unfortunately there is a gap between how little awareness is of such heritage and the greatness of such heritage,” explained Sonia Ramiz, head of the heritage promotion unit at UNESCO, and founder of the Network of Heritage Defenders Journalists International Network. France Desmarais, director of programmes and partnerships at the international Council of Museums, told attendees about the crucial need to allocate enough time for journalists interested in heritage, because cultural heritage is all about grey areas that needs to be well-researched, and journalists should focus on good news regarding heritage. “We ask the media to tell the truth, for when heritage disappears, it is as if the people who lived here once, were wiped out, with no trace,” explained Galila El Kadi, an UNESCO expert on the conservation of the urban architectural heritage in the Arab world. Samar Haddadin, a Jordanian journalist, commented that the main two challenges that faces the journalists are sources of information and information verification. “What media can do is stop talking about the golden boy, (Tutankhamun) the treasure, and focus more on the historiography, on the common life of ancient Egyptians,” explained Daniele Salvoldi who holds a PhD in Egyptology, and teaches history of architecture at the Arab Academy of Science and Technology. On a positive note, the heritage media participating in the conference had several successful models to share. One of the most outstanding was Lebanese newspaper L’orient du jour, and how they helped save a 90-year-old building from being demolished in Beirut by publishing a social history narrative of the place that inspired community members. Another good case study is Rawi magazine, which focuses on Egyptian heritage. Another inspiring session included info on the “click funding” technique, which could be put to use in the service of heritage causes; funds are raised when users click the “like” button on social media websites. “Many cities want to have the biggest building in the world, just to show that they have the biggest building in the world, but Egypt is blessed with a gorgeous cultural heritage. History is juxtaposed at the end of your street. From the Pharaonic ages to socialist modernist architecture, Egypt has a tremendous amount of treasures waiting to be rediscovered,” explained Salem Meselha, co-founder of click funding, as he explained how his new tool could help save heritage sites. However, one of the most interesting speakers at the conference was Alexandrian archeologist May El-Tabbakh. Through numerous photographs from her own personal archive., El-Tabbakh took attendees on a heartbreaking tour of the architectural gems of Alexandria and their current state: “left to decay, with total negligence of the fabric of the historic building,” as she puts it. El-Tabbakh also highlighted a common mistake where we often “victimise our own heritage” by showcasing the current negligence instead of highlighting the social history of such heritage and its importance and function in previous eras.